Jonglei is the largest state in South Sudan and one of the areas hardest hit by conflict. Three days after the civil war started in Juba 15 December2013 the state became a battle ground. The SPLA division led by Peter Gadet attacked Panpandiar and Malual-Chaat military camps outside Bor. Gadet and his forces would subsequently form part of the SPLM/A-in-Opposition (SPLMAiO). The UN received an influx of displaced people during the conflict’s first week, but struggled to provide protection. 19 December armed civilians attacked the UN base in Akobo and killed 30 civilians as well as two UN peacekeepers. The opposition took control of the state capital Bor. As other strategic cities, Bor changed hands several times in the first few weeks of the conflict. Salva Kiir declared emergency situation in Jonglei 1 January and by the time government forces gained control of the town at least 2,500 people had been killed. The fighting in Jonglei has continued: this spring and summer shots have been exchanged in villages along the road between Bor and Juba and clashes have destroyed villages in Bor and in the counties of Akobo, Yuai and Pibor. 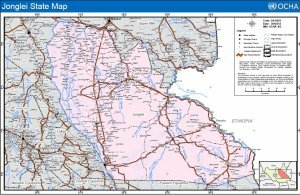 In the north of Jonglei, Small Arms Survey reported that also the SPLA is organized around several power centres where the groups often operate independently. The White Army, consisting of lose network of community defence groups have mobilized more broadly during the conflict and taken part in fighting on SPLAiOs side in a “fragile alliance”. There have also been casualties as a result of salary disputes among the police. The rebellion of David Yau Yau in the eastern part of Jonglei is one of the conflicts preceding the current war. Yau Yau has demanded greater autonomy for Pibor and Boma, the home of the Murle ethnic group. With a force largely consisting of armed civilians, he has caused instability through raids and attacks. Since early 2012 Yau Yau and the Government of South Sudan were involved in long-winding negotiations which seemed to go nowhere. However, the outbreak of the larger civil war motivated the GoSS to compromise, and in May a peace deal giving Yau Yau control of the Pibor area was signed. This concluded years of conflict, but by making Pibor semi-autonomous, the government has provided the wedge by which federalism may be introduced to South Sudan. Cholera outbreaks, flooding and food shortages make the humanitarian situation in Jonglei critical. The road network is poor and most of the rural areas become inaccessible to aid agencies during the rainy season (May-October). Security issues are also become more pronounced and the UNMISS reported that aid transport to the areas north of Bor had to be cancelled because of this.